Hundreds of people each week run to the far West end of Crissy Field, past the Warming Hut and on towards Fort Point. They continue all the way along the breaking waves of the Bay until the reach a fence with a plaque on it featuring a set of hands. Not just any hands – but Hopper’s Hands. 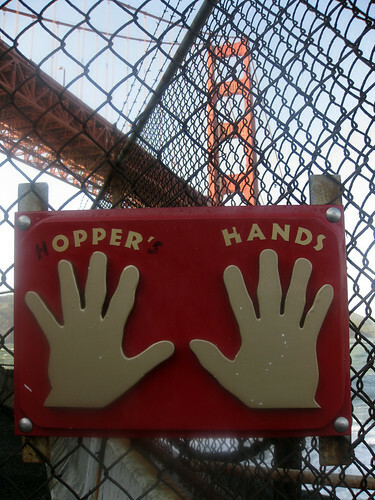 “Hopper’s Hands” gets it’s name from a Golden Gate Bridge IronWorker named Ken Hopper. Ken has been working on the Golden Gate Bridge for over 20 years. He not only does repairs on the bridge, but he is listed as a first-responder and on the rescue-call list for suicide attempts off the Bridge. Nevertheless, over the years, Ken kept seeing runners come up to the gate at Fort Point, touch it with their hands, and turn around. He asked a worker to paint a set of hands and a pair of dog paws after seeing a lady get her dog to touch the fence. If you would like to read more about Ken and the IronWorkers here is a great SFGate article. Additionally, here is a good feature on NPR about him and another IronWorker.